Nationalist activist notes paradox as national service directorate gives funds to radical leftist NGOs defaming Israel but not Lehava. Bentzi Gopshtain, director of the Lehava anti-assimilation organization, criticized on Friday the way state funds are allocated to radical leftist groups by allotting them National Service volunteers. National Service is a program that allows young Israelis to do volunteer work that benefits society instead of performing IDF service. The topic was raised recently when radical NGOs such as B'Tselem and Breaking the Silence were found to have been key sources in providing allegedly false claims against the IDF in the UN report, which on Monday charged Israel with "war crimes." The NGOs have turned to the Attorney General's Office for backing after moves were taken to remove them from national service. Speaking to Arutz Sheva, Gopshtain asked why it is that radical leftist groups receive state funds for national service volunteers, while Lehava does not. "We're collapsing under the burden of assimilation, receiving more and more cases in which people are turning to us," said Gopshtain. "We've already contacted the National Service directorate several times so that the state of Israel will also help us in our fight against assimilation, but we still haven't received a single answer." The National Insurance Institute, which supervises the National Service program, is managed by Agriculture Minister Uri Ariel (Jewish Home), who took over the Agriculture Ministry from Yair Shamir (Yisrael Beytenu) in mid-May. Ariel gave instructions to stop sending National Service volunteers to B'tselem but a legal adviser overruled him, saying the instruction was illegal. Lehava's director said that his group works for the benefit of Israel unlike B'Tselem, adding, "instead of giving a prize to those who work in the service of the inciters and the assimilationists, they should encourage those who fight against assimilation." "In our estimation they (the National Service directorate) are afraid that if they send us girls doing their national service, the whole radical Left will come out against them. Unfortunately, time isn't working in our favor and it will become even more difficult," he warned. 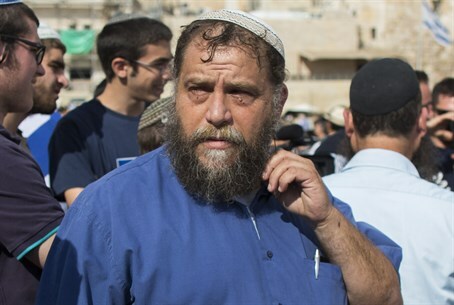 Despite a court ruling in favor of the legality of Lehava's work against assimilation, which is a directive of Jewish law meant to prevent the Jewish people from disappearing, police last December conducted a crackdown against the group. That crackdown came after three young members of the group were found to have conducted an arson attack on a bilingual Jewish and Arab school in Jerusalem that had held a memorial honoring the terrorist leader Yasser Arafat. Gopshtain argued that Lehava had no connection to the private actions of the three and that the police response was political in nature. His argument was borne out as courts forced police to release the Lehava activists arrested in the crackdown, given a lack of reason to hold them.